Seeing a plant in stages of its growth is not at all unusual if you garden. And I do. I think of gardening as a blessing, I love to grow things wild and unruly. I love to get my fingers into the dirt in the ground, I love to make mud pies. I have an unusual event happening in my garden this Fall. Every year since my two daughters were infants I received an Easter Lily from them & their father to help set the environment of spirituality for the season of Lent & Easter in our home. We are not an overly religious family, but we are deeply spiritual and Easter & the spring equinox are significant, with the traditional & symbolic gift given of an Easter Lily. 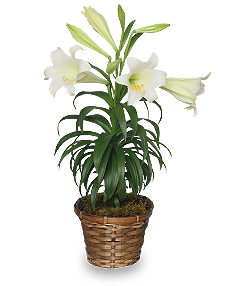 An Easter Lily (Lilium longiflorum) is actually a native of the southern islands of Japan. A World War I soldier, Louis Houghton, is credited with starting U.S. Easter Lily production when he brought a suitcase full of lily bulbs with him to the southern coast of Oregon in 1919. He gave them away to friends and when the supply of bulbs from Japan was cut off as a result of the attack on Pearl Harbor, the rising price of the bulbs suddenly made the lily business a viable industry for these hobby growers and earned the bulbs the nickname “White Gold”. Today over 95% of all bulbs grown for the potted Easter Lily market are produced by just ten farms in a narrow coastal region straddling the California-Oregon border, from Smith River, California up to Brookings, Oregon. For almost 40 years every May I would replant said lily’s outside in my gardens and flower beds. Different gardens throughout those years, and for 10 years while living in a downtown Seattle high rise I planted the plants in the apartment buildings gardens since I had none of my own. I could grow really healthy beautiful plants, but to get them to re-bloom again in their natural environment was something I was never successful with. They make gorgeous foliage with shiny green pointed leaves, adding much texture and different heights to my flower beds. But to bloom again in the early summer months of June as Mother Nature intended the following years never happened. I was okay with that, I knew from research that to get a plant to re-bloom after being forced to bloom unnaturally is not an easy feat. This past March 2013 on Easter I was in a very different space than I had ever been; not only had I become a newly single woman at the start of 2013 I also gifted myself for the first time ever an Easter Lily. It had been 3 years since my youngest daughter survived emergency brain surgery and woke from coma on Easter Sunday 2010. As I said my Easter 2013 was very different than it ever had been, my first alone, and my daughter was winning the fight to save her life a second time. After taking great care to keep my lily alive after its blooms were spent I planted it in June outside in my tiny flower bed I had created at my new little apartment. It was a late planting this year even for the high desert because we had a later than usual beginning to our spring with freezing night-time temperatures prevailing through May, making it impossible to start gardening like the rest of our state did in March. So my lily finally went into the ground and I nurtured it along, making sure through that during our warm summer days it was thriving and growing strong. Last month I noticed a bizarre thing. Growing out of the original plant were two new offshoots. Two new stalks, the Easter lily plant had propagated itself. In the fall. That in itself was different from any other time I had witnessed before. Typically the lily goes dormant after its blooms have faded and dies back into itself until spring the following year. Then… it started happening.. First one bud appeared, then another, and then both stalks created 5 to 6 buds each. I could watch almost daily out my window the buds turning into blooms. My Easter lily is blooming!! By rights This lily should not be blooming! Unless my past history with Easter lily’s( that were hot-house forced to bloom in the spring) is odd. But even the irony of MY lily blooming is enough that I think it is very cool. It is why I wrote about it, so I will never forget the miracle of Mother Nature’s strength and resilience. I think our own human spirit mirrors that strength & resilience. I needn’t speak as this post says all. You truly do leave me with a smile on my face! I am a believer in signs, in vibes and forces of nature all around us. That Easter lily story is beautiful. Easter being the season of rebirth, and your daughter’s awakening on Easter morning… what a confluence of lovely events. I also want to thank you for pointing out the history of the lily. I remember seeing my first lily in a neighbor’s yard and thinking of church bells. Don’t know why, but isn’t that ironic? This is so awesome!!! What a lovely tradition. This year the boys bought me a rose shrub for Easter. They knew that our first Easter would be very difficult. I see such a love & thoughtfulness in the boy’s hearts in giving like this and I am always so deeply moved when you share like this with stories about Vic’s boy’s. You bring a smile to my face from one ear to the other. You touch my heart always when you & I share Tess, this event is no less important and powerful in that we shared thoughts. What an awesome happening. The blessing of growth beyond expectation and imagination is the Goddess’ gift to you this season. More than a promise, it is acknowledgement of the beauty of your own heart dear one. You are limitless! It is awesome, I agree Joss. I adore how you word what is happening in my garden/life. Your words creatively put this very charming and almost a Victorian vibe to a very special event. I love that! Your support & caring nature shared with me is another Goddess Gift that I find priceless and grateful for. and a gentle hug to you as well. I like the way you think Lou. I agree, I definitely see it being symbolic that I am right where I am supposed to be in life. Thank you my friend and hugs right back atcha! Try to convince me that this is NOT some kind of sign of your struggles and victories. Strength and resilience, for sure! Blessings to you. I absolutely adore that you see the significance in the event happening in my garden too.